Our in-house capabilities include: deburring, burnishing, and more for parts made from ceramics, steel, aluminium, stainless steel, composites, alloys, plastics, and rubber. With fast turnaround, incredible accuracy, dependable reliability, and expert staff, Rodeco is your source for enhanced product quality. Rodeco has the capacity to handle a wide range of metal finishing requirements. With over fifteen pieces of finishing equipment, we consistently make metal parts cleaner, brighter, smoother, using advanced manufacturing processes. Rodeco has improved the cost and quality for our customers across the Southeast. Contact us to find out how we can shine up your parts. LEARN ABOUT OUR LAB PROCESS TODAY! Rodeco Vibratory Process Development and Job Shop Video from Kevin Umphreyville on Vimeo. 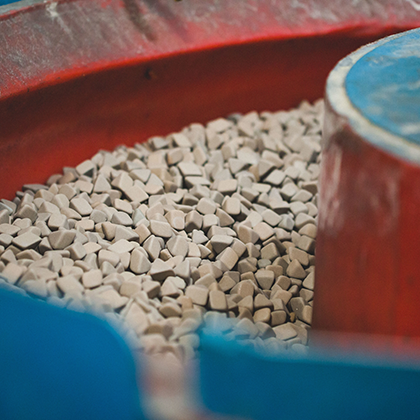 We take the four elements needed in vibratory finishing– parts, media, compound solutions and equipment– to produce high-quality, finished work. The vibratory finishing process is used for both very small and very large workpieces with either simple or very complex geometries. The high operating costs and process control needed for mass finishing can be daunting, so we worry about it for you. We know the right media and the right machines to get the job done right. Save your company’s capital dollars for something else. No capital dollars needed when the finishing work is done at Rodeco! All parts are different, with different surface contaminants. There is no reason to have the same set wash process. Over the past 30 years, Rodeco has used its creativity and finishing knowledge for over 250 metal working customers with thousands of different parts. Rodeco’s Job Shop has helped some of our customers with descaling, rust removal, cleaning, brightening, and deburring of their parts. We meet the specs for Robert Bosch, medical inhalers, automotive glass filters and Eaton brake line parts. Rodeco takes pride to meet your quality standards on time with no headaches. THE JOB SHOP GETS YOUR JOB DONE RIGHT & ON-TIME.